On Boxing Day, a large yellow and green boat pulled up next to Ceilydh. 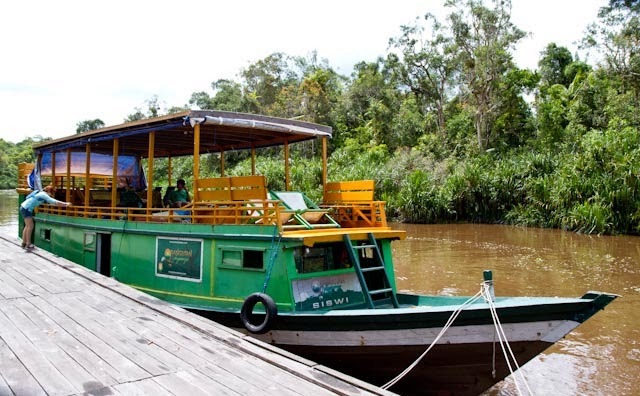 This was the boat that would take us up the Sekonyer River for three days while we go see orangutans. 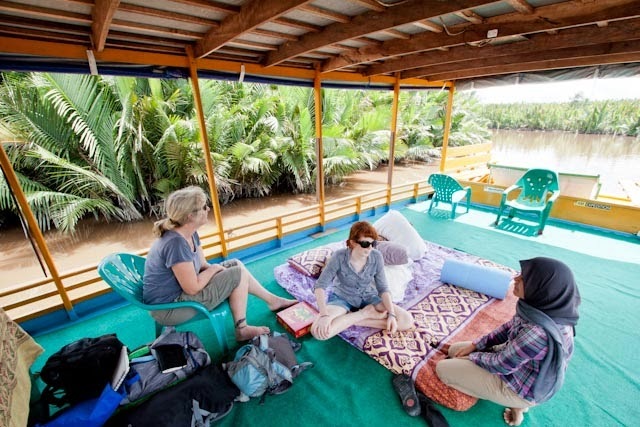 This was the trip we’d been dreaming about for months, the chance to go to Camp Leaky and also to see wild orangutans. 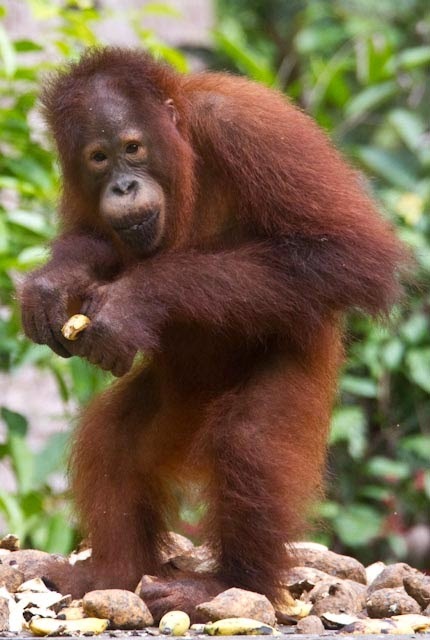 Ever since I heard of the problems and dangers that orangutans face, I’ve wanted to help. 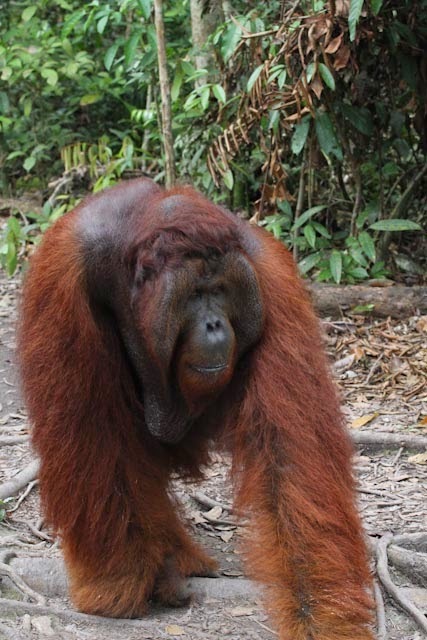 We’ve given up palm oil, and we’ve adopted a young orangutan named Bayat, who we’ll receive pictures and updates of, in order to support Camp Leaky. For me, the most important part of this trip was learning more about the orangutans and how we can help protect them. We would sleep, eat and travel on the boat with a small crew and a guide. Our guide was awesome. Her name was Rini, she was Muslim, she’d been to university and she was married to a university professor. She was very talkative and curious, asking about our travels and seeming especially interested in the komodo dragons that I mentioned. On our first day, we traveled up the river, stopping at the first feeding station at two o’clock. Rini led us through the forest, pointing out various plants and herbs for healing. “That one there prevents malaria. 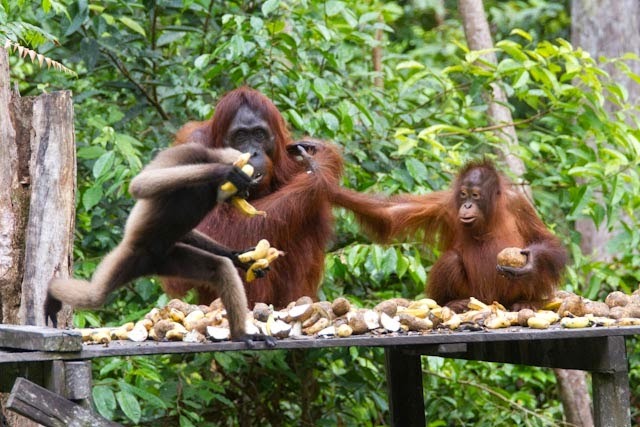 The orangutans eat it too,” she informed us. “And that one’s for mosquito bites”. There was such a huge variety of plants and trees and the palm oil companies were burning them and the illegal loggers were chopping them down. This forest is unlike any in the world. The horror of its destruction is just starting to reach the rest of the world, but luckily, Indonesia’s new president has pledged to stop the illegal logging. Soon, we started to hear yodelling guides, (that’s the best way I can think to describe them) calling for the orangutans. We walked a bit more before entering a small clearing. I was dismayed. There were rows of benches and a roped off platform covered with bananas. “It’s like feeding time at the zoo” I whispered to my mum. Soon though, I felt better as our red-haired relatives swung down through the trees to grab bananas in their mouths and then scurry away. The thing that amazed me was their eyes. They had soft brown eyes that seemed ancient and sad and so human. They would stare at you, making eye-contact for a brief moment that stretched out forever. The next morning, we headed off to the second feeding station. Rini pointed out orangutans, telling us their names, ages and a bit about them. 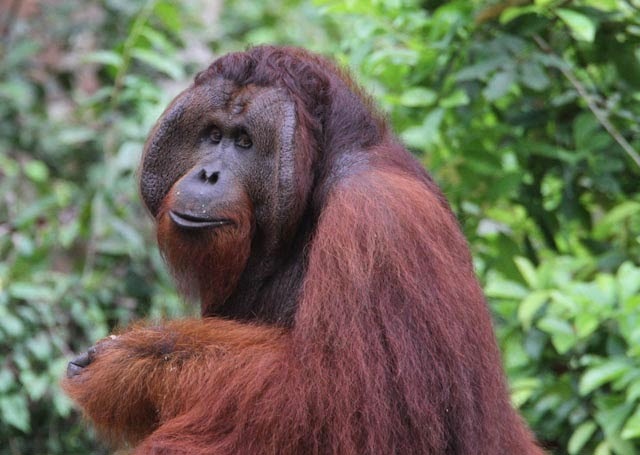 Many were the children or grandchildren of the original orphaned orangutans that Dr. Birute Galdikas had rehabilitated and introduced back into the wild. 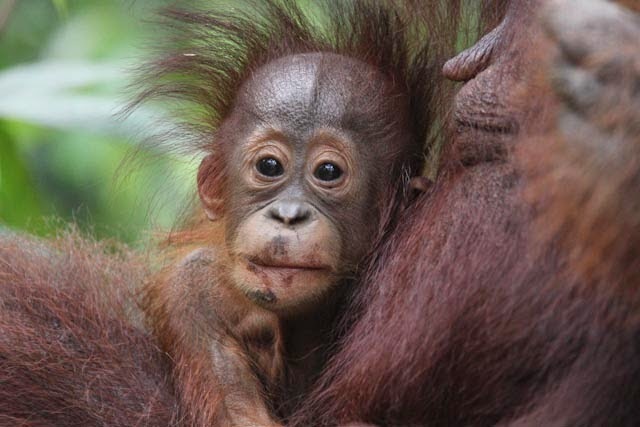 Their parents had been killed by the palm oil plantations and the babies had been taken and sold as pets. The palm oil plantations and loggers are not only killing the orangutans, but destroying their habitat; the rainforest of Borneo. Palm oil plantations only produce for twenty years, after that, they’re simply cleared away; leaving an open space that will never regrow, due to the poor soil. 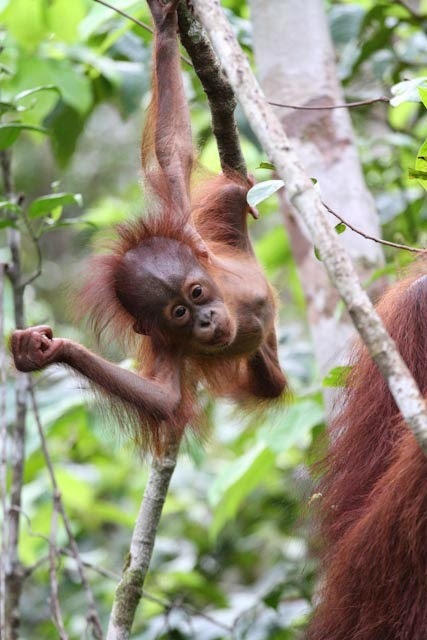 The way the orangutans swung from tree to tree was incredible. They would climb to the top of a bendy tree and then fling their weight to one side, causing it to lean over and allowing them to grab the next tree. You could see and hear them coming from quite a ways away, because the trees would bend and rustle. They were perfect and beautiful, and I felt so lucky to be able to see them. Next stop: Camp Leaky. There were people from all over the world, come to see the ginger apes. The first part of feeding time wasn’t much different than the other stations, but after about twenty minutes, things started to get a bit more interesting. Sarah, (Our friend who’s visiting from New York for three weeks) got peed on by a young and mischievous orangutan. A mother with her two babies came walking down the path. And a ridiculous looking gibbon chased a wild pig. 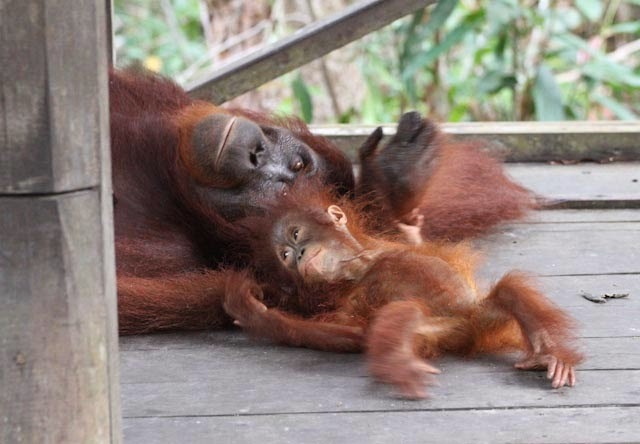 The mother orangutan’s name was Uning and her oldest baby would be ready to leave her in a year or two. She was nineteen years old, and we got to watch as she taught her five-month old baby how to climb. First though, she whacked a wild pig with a stick. There are many wild pigs that hang around Camp Leaky and the feeding platform. They are aggressive, and have killed several baby orangutans. 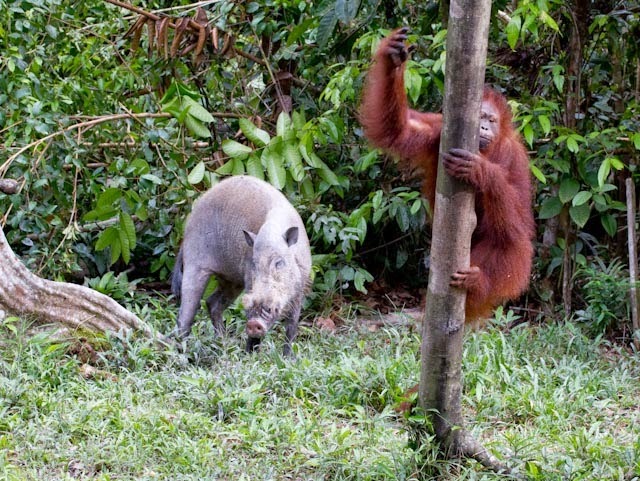 So before Uning started to guide her baby through the trees, she picked up a stick, and smacked the curious pig. Then, as we watched, silently cheering her on, she gently pried her baby off and wrapped the infant’s arms and legs around a low branch. Her baby reached out with both hands and feet, trying to find its mummy again. Uning pushed her child up through the trees, ignoring the baby’s grasping hands. Then, a large man pushed in front of everyone watching with his ridiculously huge camera pointed at Uning. (Seriously, the camera was just silly; it looked like a missile launcher). Everyone sucked in their breath as he began to take rapid fire pictures, (with flash!) of the orangutans. His guide placed a hand on his arm and requested that he stop using the flash, as it disturbed the orangutans and was against the park rules. The man shook him off; “There’s no sign! You’re not a ranger! Get out of my way” he said in a loud voice, startling Uning and her baby. He got much closer than you were supposed to and continued to take pictures. So I stepped up. 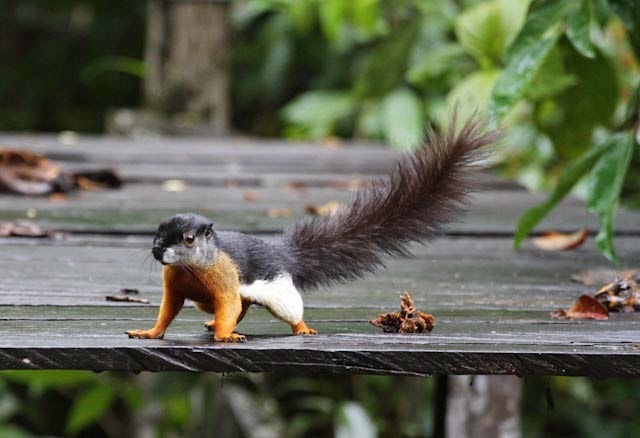 “One of the basic park rules is no flash photography of the orangutans. You’re scaring Uning and her baby” I told him. He looked at me disdainfully. “Show me the sign little girl. You need to learn about obeying the rules!” Now I was angry. “You need to learn about respecting the beautiful creatures that we have all come to see, along with respecting the people that protect them. 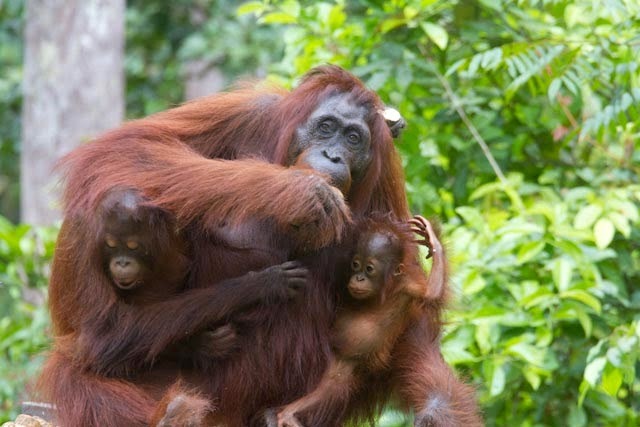 Enjoy the experience, and stop frightening the orangutans”. He blustered a bit but stopped and stomped off. Our guide, Rini grabbed my hand tightly, possibly to prevent me following him and ranting at him a bit more. “Thank you” she whispered, “You are brave to say whatever you want to say”. A few minutes later, there was a commotion from up the trail. “Tom’s coming!” people called in hushed voices. Tom is the alpha male of Camp Leaky, and he’s huge and furry and orange. He came striding down the trail, looking very cool with a shaggy haircut and giant cheek pads. He was like a rock star, he had handlers, pushing people out of his way and clearing a path. He settled on the feeding platform and ignored everyone. We were one of the last groups to leave, and I was so happy that we had gotten to see both Tom and Uning. The orangutans were so amazing, but what I found fascinating was how they seemed to show such strong emotions. They weren’t human emotions, but they were clearly reacting to the world around them. Uning seemed proud but a little sad when her baby got the hang of climbing and she was clearly wary of the wild pigs. 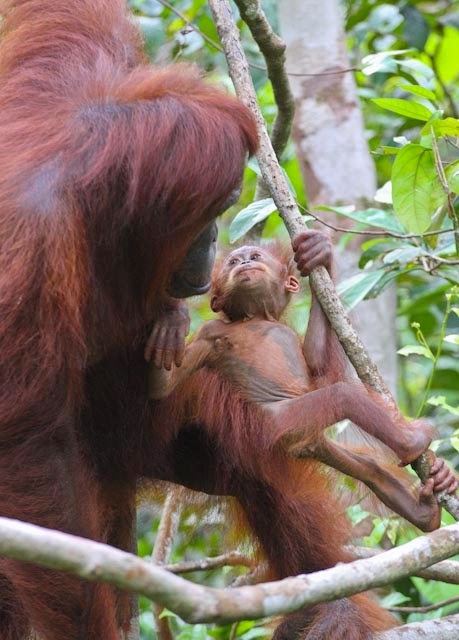 Some orangutans were just young and playful, but every so often they would look at you, and you could see just how similar to us they really are. What a wonderful post, Maia. Beautiful pictures and text, and a great telling of what it was like to be there. And good for you to standing up to that beastly man who so rudely insisted on photographing the orangutangs with flash. What an amazing experience you're having! Atta girl; stand up for what is right in all life's moments. So proud of you. What great photos you took to share with us; they do seem almost human and we treat them so badly in so many parts of the world.